As a professional, you prefer to design and/or build right the first time, and minimize liability down the road. What makes Kickout Flashing by PBZ the right choice? And, Kickout Flashing is manufactured with powder coating that is compliant with AAMA 2604 standards. Please visit the American Achitectural Manufacturers Association for more information regarding this rigorous standard. 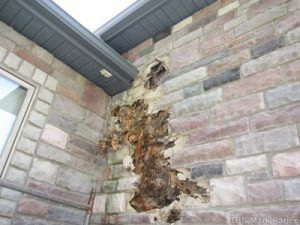 Are you a remodeler that needs to repair damage caused by moisture infiltration where kickout flashing wasn’t originally installed? We highly recommend our Kickout Flashing for any remodeling work. We offer a variety of helpful resources at this website. Select the Kickout Flashing Specs icon, or the Kickout Flashing Section Views icon on this page for sample construction specifications and sectional views. And, we have a handy Installation Diagram, in both English and Spanish! Kickout Flashing is manufactured by PBZ LLC in Lancaster County, PA. We’ve taken knowledge gained from years of metal manufacturing and developed a long-term solution that minimizes future liability at a remarkably low cost. Meets and exceeds ENERGY STAR Version 3 National Program Requirements for Water Management. Need a printable brochure? Click here. Order Uncoated - $13.90/ EA Order Coated - $16.60/ EA Colors shown for representative purposes only. Actual product colors may vary slightly from images. SIGNIFICANT DISCOUNTS AVAILABLE ON PURCHASES OF 50 PIECES OR MORE! Omitting kickout flashing often leads to major damage behind the exterior cladding. Our Kickout Flashing diverts the water at the roof eave away from the wall and into the gutter, protecting your reputation and avoiding expensive future repairs. PBZ LLC, a Paul B. Zimmerman, Inc. company. All rights reserved.